Microscopic current circuits used in electronic equipment. 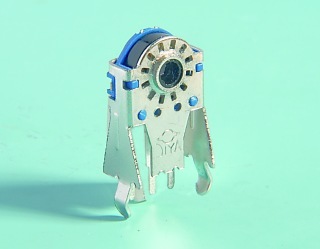 2-1.Appearance:The encoder shall have good finishing,and no rust,crack or plating defects. 2-2.Structure&Dimensions:Refer to individual product drawing . Measured by a voltage drop method at 1A Max 5VDC. Any equipment with error not more than 5% can be used. Resistance after test is the average of 5 successive measurements. 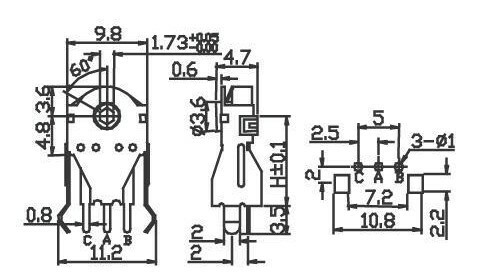 Measurement shall be made under the condition which a voltage of DC 50 V 1 min is applied between individual terminals and bushing. On the case within detent, B signal will be irregular oscillation. Shall be regarded as a part of chattering.When the code-ON time between 2 bounces is less than 1Ms.they are regarded as 1 linked bounce. The voltage change in code-OFF area.